Things to Do in Khao Lak – Discover top quality Khaolak Tours & excursions at affordable prices. Experience the unmatched beauty and serenity of Khao Lak’s natural wonders. What you have in mind you can make your dreams come true as we offer only the finest of Khao Lak’s natural and cultural sights. All our individually designed adventure tours offer the best comfort & service. You will be guided through your adventures by our experienced guides who are awaiting your questions and are looking forward to making your trip unforgettable. Similan Islands and Surin Islands at its doorstep makes Khao Lak to a popular destination for Snorkeling & Island Hopping. Enjoy Daily Tours to Similan & Surin from November to April. 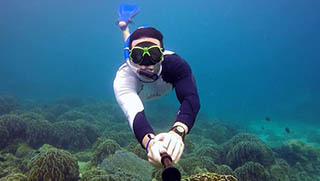 And year-round Snorkeling Tours to Koh Racha Islands, Koh Phi Phi Islands. Explore Khao Lak and surroundings with Private Tours by Easy Day Thailand. Visit Phang Nga Bay by longtail boat, live the local experience in the “Little Amazon” north of Khaolak and the Old Town of Takuapa. Plus Tours to Phuket Island & Phi Phi Islands, suitable for the whole Family. 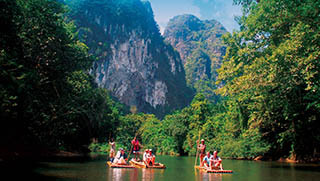 Tours from Khao Lak to explore the amazing Khao Sok National Park and Chew Lan Lake. Khao Sok offers the real tropical jungle experience with spectacular views and nature, plus plenty of fun activities like canoe or bamboo rafting. Choose the package that suits you best! Elephant Trekking belongs to the most popular Things to Do in Khao Lak, Thailand. We offer different packages to suit everyone’s needs, such as Elephant Bathing & Trekking; Half Day Elephant Trekking Tour; White Water Rafting plus Elephants. Pick your favorite program! Phang Nga Bay is just an hour drive away from Khao Lak and offers an amazing world of Limestone Islands and caves. In addition, Phang Nga Bay is home to the famous James Bond Island, which should be on your Things to Do in Khao Lak List! From November to April Khao Lak turns into a Mekka for Scuba Divers around the globe, as Khao Lak is the gateway to the Similan Islands where you can find some of the best dive sites in the world. 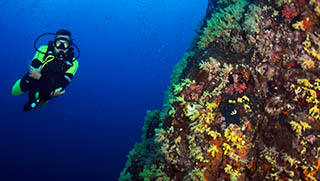 We offer Scuba Diving Day Tour, Scuba Diving Liveaboards & Diving courses.